Sunday March 22, 2015 - The supreme law of the land, the Constitution is violated with utter contempt for the people of Sierra Leone as the rat and his cabal refuse to learn from the lessons of history. Condemnation from civil society, the Bar Association, the Sierra Leone Labour Congress and all concerned Sierra Leoneans and friends of Sierra Leone. After plunging the country into a freefall of lawlessness, violence and utter contempt for the rule of law resulting in a decade-long war, the nation wreckers are at it again - interpreting the Constitution as it fits their warped minds and not caring about the consequences. Even though the supreme law of the land clearly states the circumstances under which the post of the Vice President could be deemed vacant as well as what needs to be done should that occur, the rat and his cabal in an unconstitutional and illegal move have ignored all the provisions of the Constitution. This makes the rat the subject of impeachment proceedings for going against the Constitution which he took an oath to protect and defend. 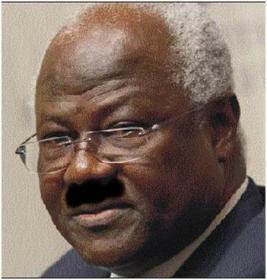 Despite written protestations from Sierra Leoneans versed in constitutional matters that his moves against a sitting Vice President was illegal, the rat, buoyed on by ill-informed and selfish members of his group has gone ahead - squeaking that he has "Executive Authority" and could therefore violate the Constitution went ahead with his dubious scheme and quite clearly an act of treason to "relieve" the Vice President elected by the people of Sierra Leone in the 2012 Presidential elections. The rat and his cabal have gone ahead to believe that the APC party constitution is a substitute for the national document, the 1991 Constitution quite ignoring the fact that the Constitution is the supreme law of the land and not subjected to the whims and caprices of anyone in or outside the country. Removing the Vice President from his party, the ruling APC with regards to his elected position is immaterial and all the noise and boorish behaviour of party hirelings to justify the rat's action does not hold as both he and the Vice President were elected by the people in 2012 having fulfilled all the requirements for a Presidential candidate and his running mate. "Needless to say since 2007 and certainly since 2012, neither you nor the Vice President is running for election or is a candidate for election to your respective offices. Your successive election to your respective offices is now a matter of history. Both sections 41 and 54 address the situation of candidates for the respective offices of President and vice President. Neither section requires continuing membership of a political party as a qualification for continuing or remaining in either the office of the President or that of Vice President. Therefore, reliance on the expulsion of the Vice President from the APC as a warrant for his removal from office, can find no justification in the textual provisions of the Constitution." Dr Abdulai Conteh again reminds the rat and his cabal that their interpretation of the Constitution to remove the duly elected Vice President is without any basis in law. "Membership of a political party is a qualification for election to the office, but nowhere is it stated in the Constitution that membership or continuing membership is a necessary qualification for or coterminous with continuing or remaining in office. If the latter is the case, then, with respect, it is a matter for Parliament to put in train the impeachment process contemplated and provided for in the national Constitution. 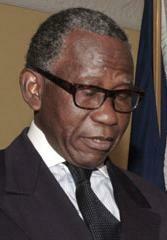 Please allow me to close by stating that the use of executive power to remove the Vice President from office is irreconcilable with the provisions of the Constitution; and in my humble view, sets to naught the sovereign will of the electorate and people of Sierra Leone so eloquently expressed when in 2007, and again in 2012, you and the Vice President were elected to your respective offices. I therefore respectfully urge that nothing should be done, least of all, in the guise of executive power, to defeat, disappoint and render nugatory the people’s will and choice. This is the essence of democracy, which I want to hope and believe Your Excellency handsomely subscribes to. It is also an affirmation of the rule of law. I end by saying that this is not the time for political diversions or brinkmanship. In the midst of fighting the devastating scourge of the Ebola virus which is set to bring our dear country and our neighbours to ruination, we should all strive as Team Sierra Leone, to beat back this scourge and not dissipate scarce human and other resources and goodwill on avoidable and needless diversions." We are alarmed but not surprised given the past tactics of the ruling APC party that at a time when public gatherings are banned as the fight against the Ebola Virus Disease should be our priority, the self-serving beasts of no nation got hired crowds purported to have been drawn from various sections of the east of the country registering their support for the removal of elected Vice President Sam Sumana. Anticipating a massive public backlash against this illegal move, they have got the human rights-abusing head of the police, Gestapo chief Munu to shamelessly issue a directive that all gatherings are now banned!!! The wretched monster did not issue such when supporters were being ferried to Freetown in support of his master, the rat. Typical AFRC/RUF tactics of which the APC was a part that increased the pains of the people a thousand-fold during the AFRC/RUF interregnum. Kindly recall that even though the 1978 One-Party Constitution was no more as the 1991 document became law, the APC led by the then President Joseph Saidu Momoh continued to have the head of the armed forces and the police as MPs and as Ministers of State though this was forbidden by the new Constitution. After fifteen years in the cold and having come back into the political limelight of Sierra Leone, the same inner core of APC activists who see everything through the lens of the One Party constitution are back and bent on destroying all the gains made by the people of Sierra Leone in their march towards democracy. We would not be goose-marched by the neo-Nazis of Sierra Leone into another situation which culminated into our troubles. It was on the basis of democratic principles and respect for the rule of law that saw this now ruling party rising from the back benches of the opposition to wrest power from the then ruling party. Having secured and formed the government as stipulated by the Constitution, they now want to tear the pages off the supreme law of Sierra Leone to subvert it for their own selfish gains - not caring about the consequences. We shall resist this using all means necessary for we know just how far we have come to get to this stage and no disciple of satan will be allowed to take us down the path we have said with one voice that we would never again tread. This contempt for the Constitution as well as for the democratic rights of the people of Sierra Leone who voted both President and Vice President must stop and such illegality and lawlessness should never be encouraged. We would urge all representatives of Western countries including the US, the United Kingdom and the European Union to please note the potential for trouble in Sierra Leone so that their governments would be briefed. We call on representatives of African countries in Sierra Leone to observe likewise lest we go back to the horrors of the past.